A fresh coat of paint brightens the south wall of 125 Mitton St. South. Inside, the kitchen has been completely overhauled and cosmetic changes to the 75-seat dining room offer a comfortable, clean restaurant in the heart of Mitton Village. The Village – buffeted by news of businesses leaving – continues to be a good place to shop, eat and do business, says John Menzies, owner of Captain John’s Fish & Chips. Menzies’ son, Matthew Menzies, bought the former Harry’s Family Restaurant building at 125 Mitton St. South last year. 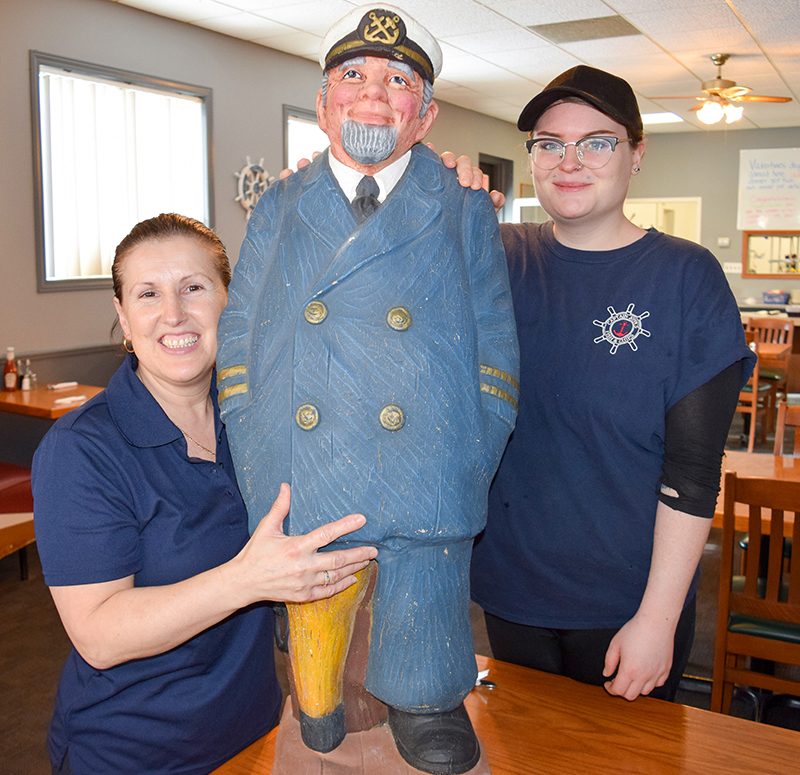 John Menzies has operated Captain John’s Fish & Chips in Sarnia since 2003. When his son bought the building, he decided to relocate from a rental location at Christina and Nelson streets. Menzies took possession of the building last year and spent a month renovating. “I immediately saw how much traffic there is on this street,” says manager Irene Da Silva. She’s worked for Captain John’s Fish & Chips since it opened at Capel and Exmouth streets 15 years ago. Menzies said he got into the fish and chip business 37 years ago in Owen Sound. He also had a restaurant in Sauble Beach at one time. The restaurant industry has changed profoundly over the years. Running a more efficient ship is necessary given the increased cost of fish and labour, said Menzies. Saving on overhead with a mortgage payment that’s lower than the rent he paid was important to sustain the business, he said. And the new location is much larger than the former one. Eight people are employed by Menzies including several high school students. Captain John’s has kept many of its standards while introducing a few new menu items. Each day brings six lunch specials for $7.50, including tax. They vary from two pieces of cod, chips and a drink to a chicken Caesar wrap with waffle fries and a drink or a fil-a-of chicken sandwich. Kids eat free on Saturdays when accompanied by an adult. Saturday also offers an all-you-can-eat option with haddock or broasted chicken for $24.99 plus tax. Regular menu items include three pieces of cod and chips for $13.65. The same meal with halibut costs $20 while haddock is $12.10. Chicken is available by the bucket or a four-piece meal with fries, coleslaw and a bun for $15.85. About half of Captain John’s customers do take out, said Da Silva. Captain John’s Fish & Chips is open seven days a week. Check Facebook or call 519-344-2525 for details. Got a great business story? Contact cathy.dobson@thesarniajournal.ca.